KOCH Records Announces Exclusive Audio Deal With Skywriter Entertainment and Breakthrough Publishing for Hit Children's Property, "Atomic Betty"
NEW YORK, NY -- (MARKET WIRE) -- October 4, 2005 -- KOCH Records, in conjunction with Skywriter Entertainment, Inc. and Breakthrough Publishing, Inc., announces an exclusive audio deal for the immensely popular children's property, "Atomic Betty" for North America. KOCH Records will release a soundtrack for the hit animated series, featuring 10 tracks and the talent of Tajja Isen (the voice of Atomic Betty) with additional releases to follow. The songs were written and produced by Kevin Gillis and Jack Lenz. 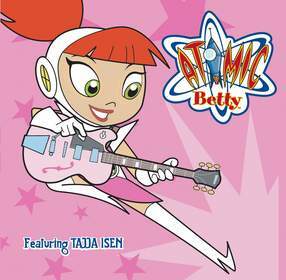 "Atomic Betty" is a co-production from Breakthrough Animation, Atomic Cartoons, and TeleImages Kids. The show airs in over 110 countries and follows the adventures of Betty, a little girl with a big secret. To classmates, friends and family, she's the slightly strange, sweet and brainy girl next door. But when danger calls and the galaxy beckons, she rockets into action as "Atomic Betty, Galactic Guardian and Defender of the Cosmos!" "Atomic Betty" debuted in the U.S. on the Cartoon Network in Fall 2004, and consistently ranks high in its time period, beating girl properties such as "Even Stevens," "That's So Raven," "Charmed," "Zoey 101" and "Winx Club." In fact, "Atomic Betty" is one of the top 5 Cartoon Network programs among girls 6-11 and one of the top 25 kids programs among kids 6-11 across ALL cable and network channels. Veronica Villarreal, Director of Children's Marketing and Business Development for KOCH Records, says, "'Atomic Betty' has proven itself to be one of the hottest brands for kids, and we are very excited to serve as the audio home for this highly popular franchise. This deal reflects the continued growth and popularity of 'Atomic Betty.' We look forward to bringing this exciting new property to retail." Kevin Gillis, Executive Producer and Producer of the "Atomic Betty" series, adds, "We are delighted to be working with KOCH Records, the leader in Kids audio with 'Atomic Betty.' Music is a big part of the success of the 'Atomic Betty' series and KOCH is a great partner to bring the songs to our North American audience." This fall, Penguin Young Readers Group has released five books depicting the adventures of Atomic Betty. By the end of 2005, there will be over 1,000 licensed Atomic Betty products. Two brand new DVDs, "Betty Set Go!" and "Betty to the Rescue! ", will be released on October 18th, 2005 on Warner Home Video. Additionally, an Atomic Betty Holiday Special will air in December 2005 on Cartoon Network in the United States and Teletoon in Canada, among other territories.